Nemanja Matic says Manchester United stars have held clear-the-air talks as they look to get their season back on track. United were dismal in defeat at West Ham on Saturday, falling to a 3-1 defeat. That was their third match without a win and Jose Mourinho’s side are already well off the Premier League title pace, nine points behind leaders Manchester City and Liverpool. Under-fire Jose Mourinho stated on Monday his belief that some members of his squad “care more than others”. But Matic, Mourinho’s on-field lieutenant, disputes that claim, believing his teammates are all giving their best. And the Serbian has revealed that members of the squad ironed out a few issues in the wake of the London Stadium loss. “I don’t think with talking you can resolve something. The leaders need to be on the pitch. The leaders are the player who are not scared to play," he said, ahead of Tuesday’s Champions League match against Spanish visitors Valencia. “We will see tomorrow and in the next games who are the leaders. For me, if you talk in the dressing room that doesn’t mean anything. Sometimes it can help but the most important is on the pitch. “Pressure is always there. All my life I play with pressure, also my teammates. We are not scared to play. Everyone is trying to win. Everyone has a big motivation to win against Manchester United. United’s display against West Ham was described as “horrendous” by defender Luke Shaw and Matic added: “Of course we spoke between us and we know the situation is not good and that we can do better. Mourinho has not been slow to offer criticism of his players, including record buys Paul Pogba and Alexis Sanchez and Matic said: “In football every day you have to prove why you are wearing the shirt, especially in the big clubs like Manchester United. “It doesn’t matter what you won in the past, every day you have to prove you deserve to be on the pitch. Tomorrow is the next chance to prove that." 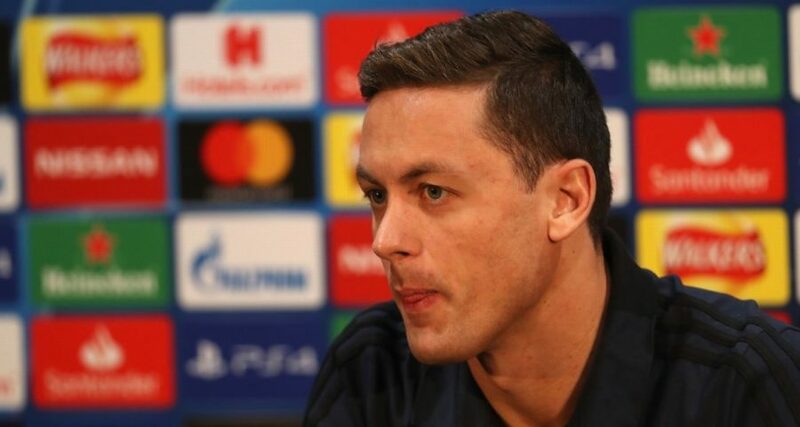 Matic was with Mourinho at Monday’s press conference and says: “The manager is trying to turn this, he is trying to make the team stronger and ready for the next challenge. And I can say that in the club everyone is giving his best to do better for the team. “We didn’t play well on Saturday but we gave our best in that moment. The game was really bad but everyone has a responsibility for that. I don’t believe that any player goes onto the pitch not giving his best. “Everyone who started the game wants to do better for himself, and after that it’s better for the team. “For me, I played one of the worst games since I signed for Manchester United. I look in the mirror and I want to see where I made mistakes and where I can do better. For sure, everyone does the same. “It’s always difficult when you lose the games and don’t collect the points, especially when you play in a big club that wants to win titles and trophies. “It’s very hard but this is football, this is life. For sure, everyone wants to do better. We know that we didn’t play well the last couple of games. “Everyone is trying to resolve this situation. We always try to win and it’s a surprise for everyone. We will try to turn this situation around and we will work hard for that. Will Manchester United sack Jose Mourinho if they suffer defeat to Valencia?